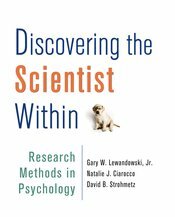 Discovering the Scientist Within features a full set of instructor supplements, including the most comprehensive Instructor's Manual for the research methods course containing nearly 300 sources to make teaching methods easier and more relatable to students. The authors provide over 20 resources per chapter, and they also include resources for the statistics and writing Appendices. In addition to the Instructor's Resource Manual, the authors offer chapter PowerPoint® slides and a full test bank to accompany the text. We invite you to preview the supplements from Chapter 8, Two-Group Design. Download the sample here.